The figure used for this unit is a Heroclix figure from the DC Justice League set. Its model number and name are #052 / Amazo. Character Bio - "The android Amazo was created by scientist Professor Ivo, who became obsessed with immortality. The original Justice League of America (Green Lantern, Flash, Aquaman, Wonder Woman, and the Martian Manhunter) discover their powers have been drained and appear to be used in the theft of certain long-lived creatures. Attempting to guard the remainder of the creatures and discover the perpetrator, the League is defeated by Amazo. 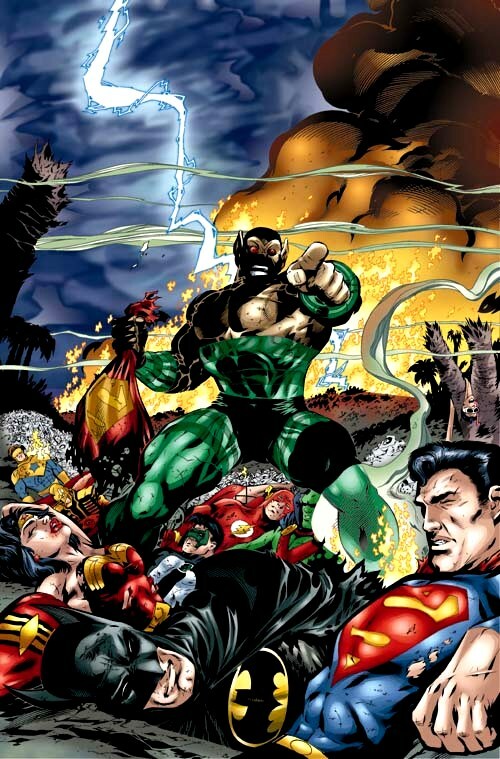 Ivo reveals he has created a means of extending his life span courtesy of the data obtained from studying the creatures, and almost succeeds in removing the League's memories of their having ever been heroes before being stopped by Green Lantern. The League defeat the android, and store it in their trophy room" (Wikipedia 2015). Amazo is an Event Hero and follows Event Hero rules. As an Android, Amazo has these Android Synergies. 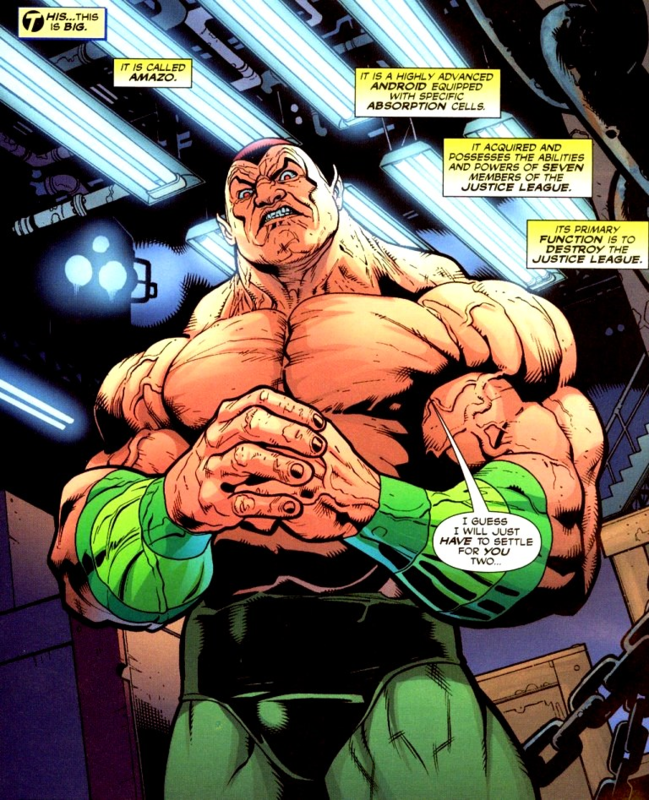 As a figure with the Super Strength special power, Amazo has these Super Strength Synergies. As an Event Hero, Amazo interacts differently with these special powers. As an Android, Amazo interacts differently with these special powers. As a figure with a special attack, Amazo can interact differently with these special powers. As a flying figure, Amazo interacts differently with these special powers. As a figure with the Super Strength special power, Amazo interacts differently with these special powers. Tiny, Large, and Huge figures are not affected by Amazo's Amazing Lasso special power. Current Tiny, Large, and Huge figures. Last edited by Ronin; September 6th, 2018 at 04:01 PM. Start the game with 3 green Power Markers on this card. Before attacking with Amazo, you may remove 1 Power Marker from this card to add 2 to Amazo’s Range and Attack numbers for this turn. 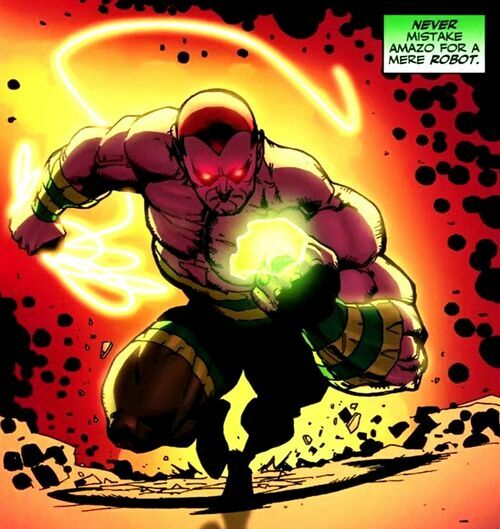 Amazo can move through all figures and obstacles such as ruins, and is never attacked when leaving an engagement. Amazo cannot be targeted by opponents' non-adjacent figures for any attacks or for any opponents' special powers that require clear sight. Instead of moving with Amazo, you may choose a non-adjacent small or medium figure within 4 clear sight spaces of Amazo. Place the chosen figure adjacent to Amazo. The chosen figure rolls 2 fewer defense dice if attacked by Amazo this turn. Figures moved by Amazing Lasso will not take any leaving engagement attacks. When Amazo attacks with this special attack, he may attack 2 additional times. After each attack with this special attack, you may immediately move Amazo up to 2 spaces. Add 1 die to Amazo's attack and defense while he is on a water space. 12/26/15 (Post-Breathing Period): Green Power Ring power changed to Green Lantern Ring power, Water Strength 1 changed to Water Might 1, Intangibility added, Amazing Lasso wording shortened, Super Speed Special Attack simplified, Life increased from 7 to 9. 1/25/16 After Ronin's test, upped cost to 520. 2/21/16 Cost tentatively raised to 600 for future testing. 2/22/16 Cost tentatively raised to 700 for future testing. Start the game with 2 green Power Markers on this card. Add one to Amazo’s Range and Attack numbers for each green Power Marker on this card. If Amazo is attacked by an opponent’s figure and at least one skull is rolled, instead of rolling defense dice normally, you may instead remove one green Power Marker from this card and ignore the attack. Amazo does not stop his movement when entering a water space. Add 1 die to Amazo’s attack and defense while he is on a water space. If Amazo did not move this turn, before attacking, you may choose a non-adjacent small or medium figure within 4 clear sight spaces of Amazo. Place the chosen figure adjacent to Amazo. If Amazo attacks the chosen figure this turn, the chosen figure rolls 2 fewer defense dice. Figures moved by Amazing Lasso will not take any leaving engagement attacks. Range 1. Attack 1, 2, or 3. Start the attack with 12 attack dice. You may attack with 1, 2, or 3 attack dice until all 12 attack dice have been rolled. After each time Amazo attacks with this special attack, you may immediately move him up to 1 space. Amazo will not take any leaving engagement attacks when moved by Super Speed Special Attack. Last edited by Tornado; December 24th, 2018 at 10:28 PM. So I definitely like the Green Power Ring power on him and the Lasso power as well, as they both feel very representative and useful. I'm happy with Supes covered under Super Strength and Flying. I'm happy with that special attack representing Flash (I added in the extra movement part since last time we talked about the design, but I really like that for helping him use the Lasso and for making him more mobile without overlapping with flying). I'm iff on the Water Strength one. It's mostly there for theme right now, rather than much utility. I'm wondering if I should put a Martian Manhunter power on there instead. Or just drop him to three powers. I'm not sure what would feel more thematically appropriate or iconic. This guy has had a ton of versions over time, but to keep it simple I'm going with the original version as expressed in the bio above (powers only of Supes, Wonder Woman, GL, Flash, Martian Manhunter, and Aquaman) with some mixing in of later developments, like the use of the ring and lasso as I felt those were the best "powers" to represent Wonder Woman and GL. On the subject of the Aquaman power, you could also try something that took a swing at mish-mashing Aquaman/Manhunter powers, but doing that elegantly would be tricky. You might be able to communicate the theme by riffing on Namor's Water Dweller, though. Just a slight tweak to that and you could call it "Intangible Water Dweller". Anyhow, not real familiar with Amazo, so I can't really chime in too much on theme. Looks like a solid power-set. I like the change to the Super Speed attack and I'm glad the lasso power made the cut. I like the combo of Pulling in someone and then hitting them and disengaging to go hit someone else. I'd like to see the fourth power just to jack this guy up. He's truly an Event Hero and I wouldn't mind seeing his points go way up. A Martian Manhunter Power would have more impact game wise which would be good but the theme with Water Strength is solid so it's a tough call. If we can come up with something that is MM based and counters WW's Golden Lasso. You're looking at a very cramped card spacing wise. He's got even more going on than Spider-Man's card, which is pretty cramped in its own right. Other than that minor concern, I really like the design direction. Which is why I'd consider dropping Water Strength. Right now it feels like it's there soley for theme, and I'm not convinced that theme is needed. A Martian Manhunter power might be fun, but I don't think there's anything I could do that would both do it justice and be short enough. Amazo may look at any Order Markers on the Army Card of a figure within 4 spaces of Amazo that does not have the Mental Shield power. I still prefer Amazo Lasso for the power name though. Drop Water Strength for Intangibility? My biggest worry is fitting it all on the card. Swapping Intangibility for Water Strength would kick his power level up, but I don't think it makes him too strong. It's not any shorter though, I don't think. If Amazo did not move this turn, before attacking, Instead of moving with Amazo, you may choose a non-adjacent small or medium figure within 4 clear sight spaces of Amazo. Place the chosen figure adjacent to Amazo. If Amazo attacks the chosen figure this turn, The chosen figure rolls 2 fewer defense dice if attacked by Amazo this turn. Figures moved by Amazing Lasso will not take any leaving engagement attacks.